The effects of climate change are most alarming in the Arctic Ocean, with rapidly rising air temperatures and declining multiyear sea ice. In particular in Fram Strait, the inflow of Atlantic water into the Arctic Ocean has warmed in the last two decades, which might have contributed to the melting and eventually could lead to a retreat of sea-ice organisms. By focusing on different organisms at different levels in the food web, such as phytoplankton, ice algae and zooplankton, we want to find out what the consequences of these changes may be. 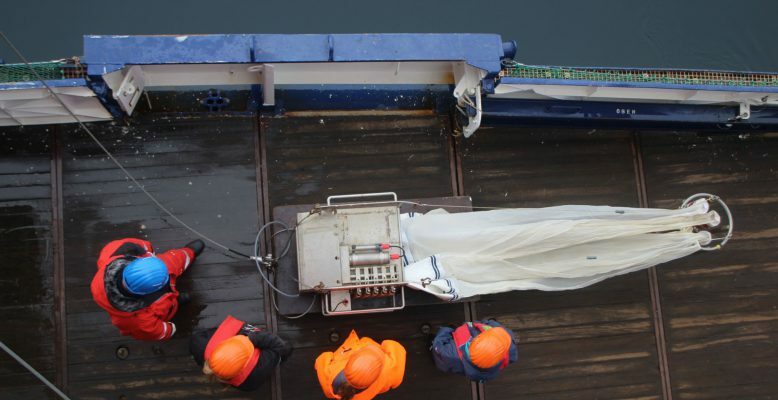 Six scientists here on board are responsible for the biological field work of this expedition, in the framework of the AMICA (Arctic Marginal Ice Zone Community Assessment) project, focusing on Arctic biodiversity, productivity and food web interactions. Our group consists of members of the University of Bremen, the Alfred Wegener Institute and the University of the Algarve (Portugal) under the lead of Holger Auel (Uni Bremen). On Wednesday, the third day of the cruise, we already carried out a “test station” in order to test and optimize the different gears. Our team had set up the different plankton nets the evening before. 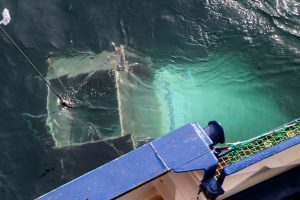 We sample with vertically hauled Multinets which have fine mesh sizes for catching smaller organisms such as copepods, and the Bongo nets that are towed obliquely for finding the larger-sized zooplankton, such as amphipods and krill. Not only the gears worked perfectly, but the sampling yielded already hundreds of crustaceans such as copepods and amphipods, two important groups on which our team focuses on. A great start of the expedition! In the Arctic Ocean, and particularly in Fram Strait, two different water masses meet: the warmer Atlantic waters mix with the cold polar waters. The focus of my postdoc project is a particular genus of hyperiid amphipods, Themisto. They are really intriguing crustaceans with huge eyes and their faces even inspired the movie Alien! In these waters, three species coexist, Themisto libellula, associated with polar waters, and T. abyssorum and T. compressa, rather linked to the Atlantic inflow. They are voracious carnivores, fast swimmers and extremely tough, which is perfect for keeping them alive in aquaria and carrying out experiments, one of the aims of the AMICA project. I keep the amphipods at different temperatures and want to see whether and how both Atlantic and Arctic species cope differently, by measuring their gene expression. This will tell us more about their resilience to ongoing and future climate change. However, a better knowledge on the ecology of the different species is also required to understand patterns of change in the zooplankton. 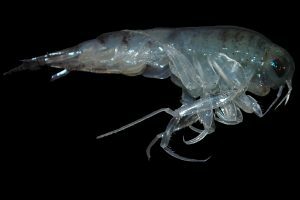 Therefore, the animals will also be used for feeding experiments, where I will test whether the different species preferentially feed on a different type of prey, and whether the juveniles and adults use different food sources, such as phytoplankton, copepods or chaetognaths (arrow worms). On Friday we reached Svalbard waters and saw land again. When navigating through Isfjorden and approaching Svalbard’s major town Longyearbyen early in the morning, all of us were outside to admire the magnificent shining glaciers reflecting some rare sunbeams piercing through the clouds and the massive bare mountains smoothened by the weight of their glacial past. The fog around the feet of these brown and green mountains gradually revealed contrasting white patches of eternal snow. Seeing some lonesome houses here and there in the treeless barren landscape made us wonder how it must be to live in this remote place. Having spent some time in Longyearbyen seven years ago, I was comparing my mental images of this unique place with what we could see of the town in the morning fog. A huge cruise liner in the port took away a bit of the charm of this northernmost town; it was depressing to imagine the influx of tourists almost tripling the population, even if only for a day. Let’s hope Svalbard can be spared from the footprint of this exploding trend of mass-tourism! Polarstern left the fjord again after a couple of hours, navigating close to the coastline with its mountains, glaciers, and Barentsburg, a Russian mining settlement. We were kept entertained by the elegant flight of the many fulmars accompanying us, and the more clumsy puffins with their colourful beaks, as well as little auks and guillemots. With our minds filled with new impressions, we went to bed early to be prepared for our night sampling, curious to see which critters the next nets will bring up!